The Garden sits astride the Crocodile and the Nels Rivers. The Crocodile River cuts down into the granite bedrock to form a narrow gorge and further down the confluence of the Crocodile and Nels River can be viewed from one of the viewpoints. 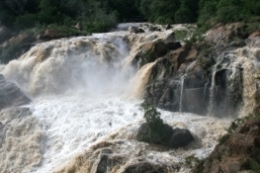 The two rivers then tumble over waterfalls within the Garden.The great Nelspruit cascades are a spectacular sight when in full flow. 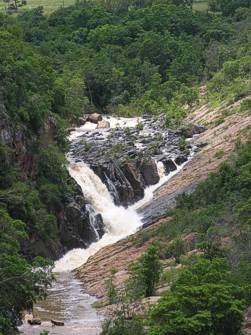 The Crocodile River, which has its origin at Dullstroom, flows through the Nelspruit industrial area, supports the Lowveld agricultural area and continues through the Kruger National Park en route to Mozambique. The Garden lies in the fertile valley of the Crocodile River and some 27 species of freshwater fish have been recorded in the two rivers.